Irish commit, Doug Randolph. Photo courtesy of Rivals. Elwood: What can Notre Dame expect from Doug Randolph as a man and a football player? 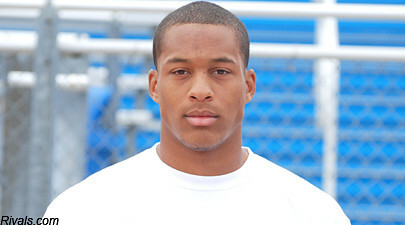 Doug: Notre Dame can expect a hard-working, mature young man who expects the best out of himself on and off the field. On the field, though, they can expect a linebacker who likes the physicality of the game and the mental aspects necessary to be successful at the next level. Elwood: All the great linebackers have the physical aspect, but they have grasped the mental game, as well. Jake: You have a teammate from high school already at Notre Dame. You have another teammate who has committed in the 2014 class. What does it mean to you to have those guys play with you in college? Doug: It is great to have the opportunity to play with those guys again. Especially CJ being older than me. When I came to our school last year as a new student, he really took me under his wing and became a great friend of mine. He showed me a lot. Elwood: Notre Dame Nation is excited to have both of you guys, as well as Greer in 2014! Jake: To be so far from home and playing with familiar faces has got to be exciting. Doug: Yeah, it is! And knowing all the other recruits as well as I do is going to be a big help. Elwood: You are listed by most sites as 6’3 and 237lbs. How accurate are those numbers? Elwood: Short and to the point…I like it. Jake: Throughout the recruiting process, you’ve had the opportunity to play against, or watch, a lot of great athletes. Who’s the best that you’ve seen so far? Doug: I’d have to say I’ve been most impressed with some of the tight ends, considering we go head-to-head the most. But, I think overall Greg Bryant is up there because of his strength to run over anyone and speed and quickness to hit holes hard. Jake: Good thing you’ll be on the same team next season, then. Elwood: Yeah, there are a really nice group of TEs coming out of high school this year. Talk about your relationship with the rest of the Irish Mob. Doug: I’m really close with all of them. We talk all the time. I was really close with Alex, and we are still friends. But obviously he has chosen to go to a different school. I talk to Devin (Butler) and James (Onwualu) regularly, too. Jake: It’s definitely unfortunate, but we know that Alex will have an incredible career at Florida! Doug: Yeah, absolutely. He is a very good player! Elwood: That’s what I love about this class. You guys are such close friends. I think it is the closest group of recruits we have ever seen at Notre Dame. It’s really changing the culture here. Jake: Take that mentality onto the football field, and it’ll be hard to stop. Doug: Yeah, we are very close. I don’t plan on losing at all when I’m there. Jake: That’s the swag we like to see, man! Doug: Yeah, I understand that it’s unlikely, and we will learn from each loss, but I don’t plan on any losses. Elwood: Hey man, you never know. Our Defensive Back, Elijah Shumate, had not lost a game since the 6th grade up until the National Title game. Doug: Wow, that’s crazy! I play too many sports for that! Jake: What linebacker position are you being recruited to play at Notre Dame? Elwood: What part of your game do you feel like you need to work on the most to make you a better player? Doug: I think I can work on it all. I do a pretty good job of pre-snap reads and rely a lot on my instincts. But I think I can work on my open field game and run contain. Elwood: I was going to say that I thought you had really good instincts. And, you are a great natural athlete which will help you in coverage a lot. Jake: Michael Deeb will probably get lost. What’s the first thing you plan to do when you step foot on campus? Doug: Getting lost is definitely high on my list of things not to do, but it’s inevitable. First thing after moving in is most likely going to be meeting up with James (Onwualu) or Torii (Hunter Jr.), or some of the other freshmen. Jake: There’s a Chipotle over at Eddy St. Commons…you ought to check it out. Doug: Yeah, I will be at that place as much as possible. Can’t live without some good food. Elwood: What does your daily routine look like when it comes to nutrition and working out for football or lifting weights? Doug: I’ll either lift early in the morning or at night after I do my schoolwork. I try to eat about 5 meals a day. I’m pretty good about my nutrition because of my mom. She is always making sure I eat healthy, so now it’s a habit. And of course, lifting and conditioning is important. Elwood: Your mom is better than mine was. I used to eat the same thing everyday. We called it “F.I.Y.” – Fix It Yourself. I microwaved a lot in high school. Jake: What legacy do you and the mob want to leave Notre Dame Nation with when you all graduate? Doug: I think we all want to leave behind the legacy of the hardest working, most dedicated class Notre Dame has ever seen. Jake: Judging by the relationship you all already have, I can definitely see that happening. Just keep pushing each other! Elwood: Awesome answer, Doug. Thank you for taking the time to do this. Jake: We’re really looking forward to watching your career develop at Notre Dame. Take care, and Go Irish! Doug: Thanks guys. Y’all, too! What’s up, I want to subscribe for this web site to take most up-to-date updates, so where can i do it please help out.